Last night, more than 150 homeowners, tenants, neighbors, and occupiers met at UE Hall with Cook County Sheriff Tom Dart and Cook County Board President Toni Preckwinkle to demand a one-year moratorium on foreclosures and evictions in Cook County. Below are some photos from the event, which was hosted by a coalition of Communities United Against Foreclosure and Eviction, Chicago Anti-Eviction Campaign, and Centro Autónomo in Albany Park. 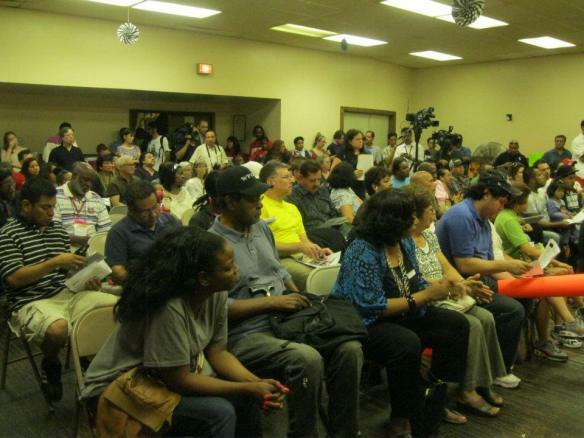 The room was packed with folks facing eviction, their allies, and members of the media, who heard speeches from homeowners, tenants, and residents of public housing and Section 8. Photo by Megan Selby.